2P START! Live! : Off the Air Edition | 2P START! LAST? YOU’RE SAYING THERE IS NO SEASON 4? Gonna miss listening in every week. Listening as I type this, loved the intro theme. Well, Good bye 2p start. Brilliant, loved the edited intro. have fun in the future Ray and Tim. Best & Worst theme: de Blob music! Your last podcast…….I’m going to cry for sure now. I am truly going to miss listening to you two every Monday night. You ALWAYS make me laugh. I hope you make some random ones just to keep us from getting too depressed. Best to the both of you!! Man, nostalgia flowed through my veins. I’ll be making sure to check back every month or whatever. Good fortune in your futures Ray and Tim! Well… this is The End. 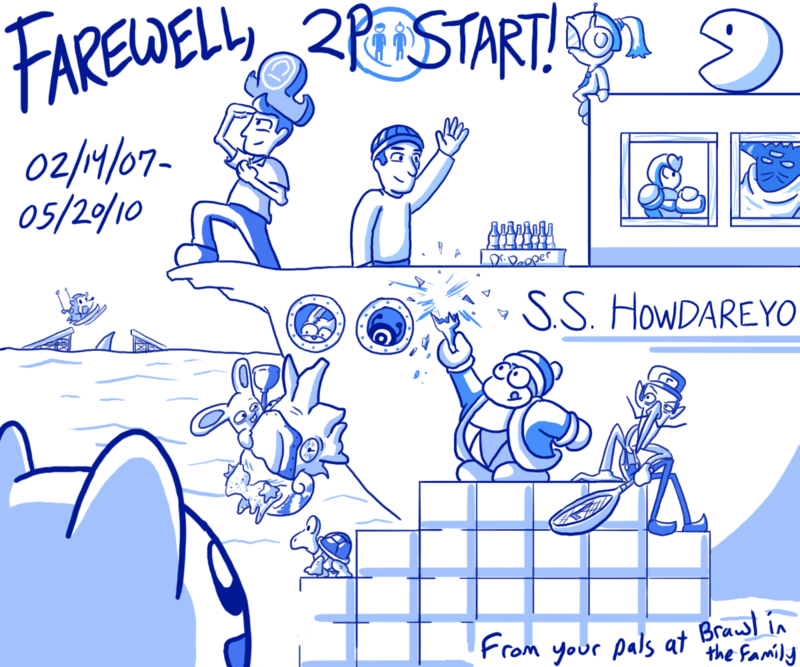 It’s great that you two will still be doing things even though you are going your separate ways… but now is the 2P END. I’m going to be removing 2P START! from my Webcomic list in my favourites… but I will still visit you. I have to finish my wallpaper tribute, and I’ll still keep in touch with you via Twitter. Also, is it weird I just finished listening to “Tomare!” from Haruhi Suzumiya before watching this? I can’t wait to listen to this, I just have to wait for my stupid computer to load it into I-tunes. It’s been great guys, I haven’t listened to the pod-casts for that long, but I’m glad I jumped on the bandwagon before it ending. I’ve really enjoyed listening to them, and listening to all the topics you bring up. I still want to hear all of that “This Book’s going to be a good book” song, but if it never happens, I’ll have to be content with listening to that 10 second sound clip you played for us all. Any way, Thanks for all the laughs, maybe now that i don’t feel i have to listen to a new podcast i can listen to the ones i haven’t heard yet and pretend those are the new ones. It was this thing done at school in my County, believe it or not. I was pretty amazed to see it mentioned on this podcast. I was scared that it was done at my old Middle School, but no, it only looked similar, and was a different one….. Enjoy, if you can. Im sorry ive risen from my grave to late, but seeing how this is my last chance, ill go for it. Id dont remember how i found the site, but i backtracked to the first comic and read up until ??? (ill never know). My first podcast was cloudy with a chance of ps3, which was hilairious. I do want to say this. I thought the original panel for the yoshi comic was pretty funny. Anyway, thanks for the comic, the podcast, and a new begining. i feel inspired to start my own webcomic now(probally wont be as updated a smuch as yours was before). Thank you for the entire 2p start ride. Whenever I see a donut now I’ll think of the podcast. And Tim. ..bench-pressing a PS3 to lose all the weight the donuts gave him as he becomes depressed and almost the new Mr. Luggs because he had no script to write to “waste time” with. Okay okay, I’ll stop. And I thought I heard a final Tim Checks on the Baby coming in the background. No? RATS! I really wish you weren’t ending the show. Honestly, you guys could definitely pull it off even if you took out Comic Talk. Tim With The News, Off Topic, Black Doom, Comment of the Week, and everything else on the show will still be very appropriate. Thanks for the mention, Tim. That’s really all I had to say, just looking back and remembering all that you guys have done and the impact that you’ve had, the only thing I could feel was satisfaction that you ended it so well. Well, at least I can say I have that empty feeling inside. I’m having trouble thinking of something to write, so perhaps it would be best to leave what comes to mind. Tim, Ray… Everytime I make toast, I’ll think, “Gee, Tim and Ray used to make toast. I can’t possibly do it like them. I’ll never eat toast again.” Same goes for playing video games, talking, breathing, etc. On a serious note, thank you Tim. Thank you Ray. It’s been fun and I hope to see you guys down the road. Until then, best wishes and best of luck. So this is it, huh? Tim, Ray, I wish the best to both of you. End knowing you’ve truly done something excellent. Putting that Galaxy track in there at the end was genius. Just gave a minute of reflection over everything that made 2PSTART! great. Thanks for everything guys. My last comment on 2pstart.com. I loved that you used the smiles and tears music from earthbound. Um good podcast. I really don’t know what to say I guess goodbye should work. But then again do you deserve it? Maybe I would have said goodbye if your comics were still good. I have a feeling that I’m just saying I got to drop it while It’s hot goodbye. And now with this, 2P Start! as we know it is over. As I said on your last podcast, you guys had a great run, and I hope the best for you guys as you leave this site. With that, I must bid you a farewell for now. Goodbye guys. I’ll always fondly remember that 11PM Skype conversation we had, even though it was only 7 minutes long. I wish you both the best for the future, although I have no idea what Tim actually does. Have a great time enjoying your wednesday and sunday evenings. And to my fellow fans, until we meet again, farewell and good luck. P.S. What’s the music at the end of the podcast? is it from a game? P.P.S. If it’s a no on the book, perhaps an iphone/ipod touch application? I’m really gonna miss listening to this, and I’d love to see more from you guys, be it an E3 special, or an entirely new podcast. Also it’s an honor for my little song to be featured in the very last 2P Start! Live. Thanks for everything. You guys. I’ve only been reading since comic 154, but I’m still sad to see you leave. I really regret not getting into this comic earlier. I just want to say how much fun I had in the short time I spent here. Listening to your podcast has been extremely enjoyable; you two radiate a very friendly, charismatic aura that really appeals to laid-back people like me, and your humor is so natural. I’d love to hear more from you in the future. Congratulations on a comic well-done, and good luck to you both. kinda weird how much it feels like you know someone you’ve never even met just by listening to their podcasts. Aww man, it’s all over now. Listening to this podcast, it just hit me. I was already feeling pretty bad, and now this. It’s quite depressing. I’m gonna go sulk in my lonesome… probably relisten to all the podcasts I guess. Actually, what are some good podcasts to listen to, to fill the void? I meant like, different podcasts… like the Lame show or something. It’s got Eddie, and I always enjoyed Eddie’s presence a lot on his guest appearances. That ending almost brought a tear to my eye. I can’t wait to play Mario Galaxy 2. Great Podcast Guys, a very nice finale to Season 3. The argument at the end was quite unexpected and hilarious, and makes me hope even more that we hear more podcasts from you two in the future. If this turns out to be the last, though, this was still a fitting way to end yet another great series. Anyway, as I said before, good luck in the future, and I’ll check back every month. *ahem* Goal for summer numero uno:See how quickly I can listen to all the 2P START! podcasts. Goal for summer numero dos:See how quickly they’ll slap me in the face with nostalgia. So long guys. I would say goodbye, but you aren’t leaving for good. I’m definitely looking forward to what you bring us in the future. Including (but not limited to) Ray’s upcoming album. It was a wonderful end Podcast, and I’ll miss listening to the new ones. Now go enjoy your lives free of 2P START. You more than deserve it. At one point, it was extremely sad, then, I was laughing like crazy. While I’m sad to see it end, I’m glad you guys can finally move on. You should be proud of everything you’ve done. I appreciate how hard you guys worked for us. How can you be sad when this site has been so successful? You’ve accomplished many things, and I just want to say thanks for everything. I hope to hear from you guys on this site again. Great podcast guys, and I was happy to do the tribute! Good luck with your future projects–you two are definitely talented enough to find another way to reach people. Also really enjoyed the use of “Smiles and Tears” in the podcast. Well, thanks for our work guys. I appreciate it. I meant thanks for your works. Spellcheck greatest downfall, failure to catch improperly used words. I’ll miss you guys. Looking forward to your possible E3 special. Welp, it looks like the end of it all. Bye I guess. Hehe Jory, I remember him. He ran over Raybox. Good times, Good times. Thank you guys. Its been a fun trip. Good luck with everything. Thid was amazing, guys. And not just this one podcast. You’ve made my day every Thursday and Monday for about 3 months, and I owe it to you both to leave at least a comment. Heck, I should probably buying out your store right now for all the free entertainment, stability, and completely clean content you’ve given me. I do have a few regrets though, but they are not your faults, I am simply making confessions. I never finished all the podcasts. I read 1-8 and all the current ones biginning with War on Terror Edition, but not all. I should have, but I’m just too lazy, and now I feel it’s a bit too late. But again, I must thank you. The both of you are wonderful people, and a fantastic duo. May the rest of your lives be incredible, and both of you team up for future collaborations of immense proportions, as you two, together, make outstanding work. Farewell, and I know I am unhappy to say this, but this is it. Now I’m going to go eat a donut. Well 2PSTART! this is it. This is the end. You have been the highlight of my week for almost a year now, you make me laugh every time you post something, you make me have to explain video game jokes that none of my n00b friends get… And for that, I thank you. I wish you both luck in your future endeavors. Whether alone or together (eh, sorta rhymed there) you will both go on to do great things. Speaking of great things, Ray, you should know that out of all the albums coming out this year, yours is the one I’m most excited about. I’ve been singing The Digit of Death for two or three days on loop now and my family is going mad. They appreciate it greatly, I’m sure. I just hope that you guys realize how much the two of you mean to each and every one of your fans. We will miss the regular updates and being included in your lives greatly. No really, I can’t express how much you guys have graced the internet. You can call it a website, a web comic, a podcast…whatever. I don’t think anything out there even compares to everything 2P START! is, with all it’s personality, originality, clean, witty humor, cheesy inside jokes and hilarious moments throughout. In all honesty, i just wanted to thank you guys one last time for a job well done. Anyway, I have really loved following this site for the three years it’s been up, and I can’t stress this enough, you guys have been like a second family to me when I get bored. Can a series of comics and podcasts be described as life-changing? I think so. I actually started to cry. i love you guys, and hope you are successful in everything you do. Thank you for everything you have done. Great ending guys, I await your occasional update on here and hope you do future projects together! This site is the epitome of what the internet should be. It seems I’ve come too late to this site. I was first linked to the Mario Kart comic, but I only went through the archives after I read that this site was pretty much done. I only listened to these last two podcasts and I wish I was around for longer. In these brief few moments, I’ve gotten nothing but good vibes. You guys pretty the epitome of two guys just having fun. glhf Ray & Tim with whatever comes next for you two. if I’m gonna leave a last comment, it will be comprehensible damn it! Well, I mentioned that I would save my formal goodbyes for today, in part because it’s (still) hard to believe 2P START is over, and in part because I needed more time to think of how best to express my tremendous gratitude for what you’ve done and shared with us through this site. The comics. 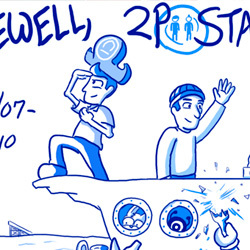 Webcomics (even comics in general) rarely make me laugh out loud, and 2P START has been one of the few out there to do so to me multiple times, with a sense of humor that often aligns with my own, including the relative absence of “mature” jokes and themes. Couple that with the best webcomic artwork I’ve yet seen, it’s really no wonder why 2P START has been one of my all-time favorite webcomics. The Podcast. 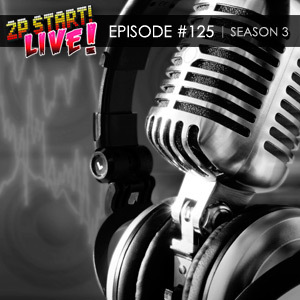 I’ve sampled a plethora of Podcasts in all my time on the Internet, and I never continued listening to any of them beyond one episode until I discovered 2P START Live, which got me hooked from the first listen to hear the entire archive and all episodes to come. No other Podcast even compares, and that’s honestly no overstatement from me. Every week I’d listen at the first chance I got, and during the school year it served as a major source of stress relief for me (I guess I’ll be relistening starting from #1 each week starting next semester); it practically became a routine part of my life. Your dedication. As a webcomic artists myself, I’ve grown to really appreciate the dedication it takes to keep a regular schedule on publishing new material, and even moreso when I realize you’ve been releasing material four times more frequently than me. Which leads me to mention that I also feel Blue Starlight needs to thank you for the guidance it took from 2P START to get to where it is now; 2P START is the whole reason BSL has a regular schedule now, higher graphical standards than before, and a lack of several formerly-planned vulgar-esque scripts. Part of the 2P START spirit lives on through BSL by those influences, and I can’t imagine it being alive today without that spirit pushing it forward. You yourselves, Tim and Ray. Though it’s only been little over a year for me and there hasn’t been a lot of direct interaction between you guys and me per-se, it still somehow feels to me as though we’ve been personal friends for years, even if only through getting to know you guys so well through the Podcasts, and feeling like I have so much in common with your beliefs and interests. It’s not at all a stretch to say that right now, it feels as though two of my closest neighborhood friends are getting ready to move away to another country; you’ll be missed. So, Ray, Tim, thank you for all the comics, laughs, Podcasts, entertainment, dedication, guidance, and for just being who you are; it’s hard to overstate my gratitude. Goodbye, 2P START. Tim and Ray, I’ll keep subscribed via Feedly and Twitter, so it’s probably at least half a century too soon to be saying goodbye to you guys just yet. 2P START or otherwise, I’ll be looking forward to hearing from each of you and experiencing your future endeavors. Take it easy, and have a great summer; you guys deserve at least that much for giving us a continuous stream of pure awesome over the past three years. It seams like Ray is trying to let the fans down easily and Tim just wants to get done with this as fast as he can and get out of here. It’s been like this for the past two podcasts. Ha ha, I read some of the comments before a listened to it and some people said stuff like, “oh man I think I’m gonna cry now.” and I was like, “Psh…I’m sure it will be good but I won’t even get close to crying.” Then guess what. I pushed play and I almost started crying. Oh and, I can’t find out how to change my picture. Does anybody know how? Tim, keep filling that pool of money so you can pay for Lily’s college fund, and Ray, I hope you find your Miley. Farewell 2P START. I’ll miss you. Now that this work of amazing is over I dare say I can say which comic is my favorite without thinking: What if something surpasses this? My favorite comic of my most prefered Webcomic series is without a doubt “LandMaster” due to the sheer chaos of a Landmaster ripping through the roof and the absolute terror / confusion on Tim’s face. Reminds me of when I play Co-op with my cousin, in which, chaos would happen due to my cousins unwillingness to think ahead and I could do nothing but react and think “What the hell did you just do?” While it was not your most recent work most of your other comics almost reach the same level as Landmaster. G’bye 2P start and all the best to the both of you. On the topic of the Podcast: How dare you?! I was hoping for a three hour epic, I assumed that is why you saved all those fifty grave risers. This podcast used to be good… Wait it still is, only that it too is over. Chances are I’ll lurk around… Perhaps bring new… blood? Nah perhaps… fingers? Sure! I’ll bring new fingers to the forums. Exciting! I’m going to miss you guys making fun of all of the ludicrous swears/”humor” out there. That segment of this podcast was hilarious (think of it as the double-negative rule… saying something negative about something that’s negative equals positive!). …By the way, why do I get the feeling this podcast has severely channeled Mario Galaxy AND Earthbound in regards to music. Anyway, if you do stuff, I say blog or podcast. Thing is, if you blog, PLEASE utilize the same humor as the podcast! …oh my word, Tim, where’d you get that phrase? “It’s been real. It’s been fun. It’s been real fun.” My parents say that, and they’re senior citizens! Thank you so much, you have changed the webs and webcomics forever, practically made my humour and inspired me to one day make a videogaming site with a Podcast like yours. I’ll even hopefully have my own sort of Black Doom Award! Again, thank you for everything and good luck with whatever you decide to do with yourself! Always remember there are people who think of you as idols. I was going to listen today, but due to some tragedy, I’m going to tomorrow. I download it, and add it to my iTunes, but I forgot to sync my iPod. Well, this is it. Thanks for 4 months or so of awesomeness. Thanks for the comics, the podcasts, the opinions etc. etc. etc.. This podcast was pretty awesome, although the music at the end kinda freaked me out because I didn’t expect it at all. I seriously thought at first that I was being abducted by aliens or something. Anyway, good bye guys, and hope that whatever you plan to do next is of equal or greater quality than 2P START!, although it is going to be kinda hard to top. Well, my Mondays and Thursdasy officially have gone back to be boring. Unless Brawl in the Family starts doing podcasts and putting up comics on Thursdays, too. That would be kind of nice. P.S. Funny you should mention the last week of school, considering school ended last week for me. wow not only a great send-off to the comic but also the podcast…. Thank you so very much guys. You had your cake.. and ate it too. I’ll be stalking you both on Twitter and the RSS feed for when you release something awesome.. which seems to be most everything. Well, I already said most of my piece over at comic #171, but if the end of 2PStart isn’t worth two farewells, than I don’t know what is. I’ve been following this site a relatively short time (since the BitF guest strip), but it has still made a large impact on my life. I can’t express how enjoyable your podcast is to listen to; I’m tempted to say I look forward to it more than the comics themselves. This last one was no exception, and I smiled and laugh my way through it. You two have done something really great here, always pushing the limits of your humour and artwork. I won’t whine and complain and ask for you to bring 2PStart back, because I know of the horrible things that can happen when a series loses its steam but insists on continuing. Nothing lasts forever, and you shouldn’t try to make it. That being said, it would be a shame for all the talent you two have to go to waste. Don’t get me wrong, I know you’re both going to be busy living your lives (it’s not as though you’re just going to sit on the couch and stare at the wall now that 2PStart’s done). What I mean is, you two should consider doing the odd game-related thing here and there, preferably together. I for one know that I would happily watch hours of Let’s Plays, walkthroughs, and reviews starring Tim and Ray. More podcasts couldn’t hurt either, even if they weren’t game related; only I remember Ray mentioning that he wouldn’t know if the podcasts would have a point if they weren’t a compliment to the comics. If you two worked on some other project together, it would give the podcasts a reason to exist again. I’m not expecting anything, just presenting the idea to you for your consideration. Well, goodbye for now, and once again, congratulations. …This comic used to be good. I wasn’t going to comment originally, but it feels inappropriate to not take part in the sending off of one of my favorite webcomics. I really have nothing to say that hasn’t been said, because I’m sure that all the praise has had your egos floating out of your heads. I really am at a loss at what to say, so I guess I’ll keep it short and sweet: Goodbye Tim, Goodbye Ray, Goodbye 2P Start! Well.. ends up I don’t have much to write. 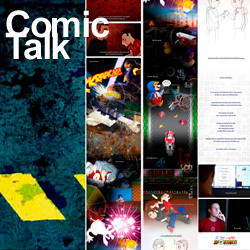 You 2 did a great job through those 3 years maintaining the comic/website up and updated. It is a great deal of responsibility and commitment and, we readers, have been lucky to be treated so, even if some of us are severed cats on fire and such things, despite your suggestion of using an internet identity you would use in life. You still influenced people out there, I’m pretty sure, me? I dunno, maybe, who knows (probably not much). You stayed true to your type of humor, Cold cold mountain might just have side a little more toward the dark side of your creativity but it is still done cleanly like you explained in the corresponding podcast, and some dashes of that “dark” side can often be found in others too. You stayed true to yourselves, and that’s probably what make you so great, you didn’t tried to sell out in an attempt to bring even more readers. So on that note, this comic still is good (it is going to archive right? so all the quality, and some rare lower quality comics are still around to enjoy). I enjoyed Mario on steroids, for real. I didn’t follow LOST. May you 2 be successful in your present and future projects, big or small, critical or not. Well, Good Bye Guys, thanks for the inspiration and laughs. I will be checking back, even without new content because the 171 comics you guys posted are awesome enough! Once again Thank you Tim and Ray, you to are awesome and I only wish the best for you two, your family, your friends, and all of your fans. And as I and everyone else slowly drift back into our graves I want to give one last piece of advice your probably already know…Follow the words like they were a song…. Well, after listening to your little Lost rant, I was reminded of my viewing of the finale, involving my parents who’ve seen about half the episodes. Luckily they watched the little recap beforehand and were half asleep, so they weren’t too annoying. Anyway, great closing podcast, made me laugh out loud once again (causing some strange looks from my brother), and you will be sorely missed. This comic used to be good, just saying. That is going to be the last I’ll hear those voices. I’m one of those people who finds a site and just checks it every day for something new. And I still will. As a dedicated fan. I will remember you. Listen to every podcast again. Read every comic and update again. Now, it’ll all be the same. 2P START…now 2P STOP. Good luck with life. Good luck finding your Miley Ray. Good luck with your kids and wife Tim. If you ever come back I’ll be there. 3 Years of bliss. You made me laugh and inspired. Ray, you should be a pro artist. Tim, you are a great talkshow host. Now you have to end it all. All. I am coming out of the shadows. All just to say these five words. Good Bye 2P START. Forever. I think just a little E3 conversation should go up, just so you can throw your thoughts out. You wouldn’t have to edit it, you could just talk and post. I’m absolutely sure that the fans would appreciate it. Promise you’ll consider it in the very least? I think you should have picked out a Black Doom award as well, but that’s what the Knubby Awards were for I suppose. Well, in the meantime, I’m going to go eat a donut. Nice touch with the SMG ending. And I hope you eat that doughnut. Glad to hear there may be a new podcast in June. I will keep refreshing until then. The ending was so beautiful!WHYYYYYYYYYYYYYYYYYYYYYYYYYYYYYYYYYYYYYYYYYYYYYYYYYYYYYYYYYYYYYYYYYYYYYYYYYYYYYYYYYYYYYYYYYYYYYYYYYYYYYYYYYYYYYYYYYYYYYYYYYYYYYYYYYYYYYYYYYYYYYYYYYYYYYYYYYYYYYYYYYYYYYYYYYYYYYYYYYYYYYYYYYYYYYYYYYYYYYYYYYYYYYYYYYYYYYYYYYYYYYYYYYYYYYYYYYYYYYYYYYYYYYYYYYYYYYYYYYYYYYYYYYYYYYYYYYYYYYYYYYYYYYYYYYYYYYYYYYYYYYYYYYYYYYYYYYYYYYYYYYYYYYYYYYYYYYYYYYYYYYYYYYYYYYYYYYYYYYYYYYYYYYYYYYYYYYYYYYYYYYYYYYYYYYYYYYYYYYYYYYYYYYYYYYYYYYYYYYYYYYYYYYYYYYYYYYYYYYYYYYYYYYYYYYY! Bye………. You can have my doghnut. Just scrape off my saliva. Been a long time reader, but haven’t listened to many podcasts due to… Well, not much reason. I have been listening to recent episodes, and am highly considering going through the entire archive of podcasts. Sad to say that this is farewell, maybe only for now, maybe forever. Thank you, I know I will miss your comic. It really is sad to see long time comics disappear, but as you mentioned, at least you had the decency to finish. Will always love you guys, hope to hear updates about any future endeavors. I really love you guys. I can’t think of anything to write, but, well, you guys are great and if you do any new projects in the future I’ll be sure to check them out. Excellent podcast guys, see ya next week! We can only hope, Metal_Link, we can only hope. Thank you so much guys for an awesome- no, the best webcomic there was, is, and probably ever will be. Though I was kinda hoping for a big graphic that syas “PUNK’D!” for the podcast ending. I wasn’t really ready to answer the question “what do we bring to podcasting” until i finished listening to this episdoe, and i have to say i just like hearing your opinions on things, and the production is really just out of this world. If you don’t wanna continue, i hear ya, but if you stick around podcasting i’d be so much happier. I know the BBPS took a fair few months off, but eventually decided they enjoyed it more than running the site, and have just got back into a bi-weekly cast that really hits the spot, and are now expanding the scope outside of videogames to all things they wanna talk about. Really, sonic, seatbelt laws, elections, movies, you allways provided an insightful look at thinks from your own angles, and it really was a pleasure to listen. I really wish this podcast could go on forever, but alas all good things must come to an end. Thank You, Tim and Ray, for for providing a great source of wholesome entertainment. There is just somthing special about you guys and your show that no one else has. If you were only to put out a podcast once a month or once a year, you could count on me to be waiting for that unique experence that is 2P-Start Live! – I like what you did with the last comic, with the panels going to vector work then fading. That was a great effect. – You wouldn’t be able to make a 2PStart book because of the last April Fools comic. – Why are you calling me a lo… I mean, I’m glad I’m nothing like Penny Arcade’s fanbase. – An undead army? Why don’t you have those already? I’ve had 4 of them. – Baddest Company? I liked that one. The facial expression at the end was genius. – I’m a nerd, but there’s NO way I’d ever dress up as a video game character for my wedding. I just finished listening to the podcast, I’ve been reading this comic for about 2 years now, and I only started listening to this last week, when I knew the comic was ending. This is also the first time I have ever commented on this site, I thought it’d be fitting to do so now. Of course, everyone is going to miss 2P START!, but I’m so glad that you ended it on such a high note, it’s always awful when web comics fizzle out with no warning, leaving the readers without a conclusion. I loved checking out the site every week for the new comic, and I don’t know what else to tell you guys, so I wish you both good luck for the future, and to keep us up to date on any future projects, and thanks for having made such an awesome web comic! Out of town right now so I’m currently unable to listen to the podcast. And in a way, I’m not sure if I want to. But of course I will. You guys had a good run and provided a lot of free entertainment to your fans (both deluded and normal) and for that I say thanks. I’m sure I’ll have more to add once I listen to the podcast, but for now I’ll settle for grumbling over my inability to play SMG2 this week. Have fun playing Galaxy 2 and good luck; or should I say, break a leg? “2P, or not 2P.” Tim and Ray chose the second one. Fixed the Lace sprite pic to make it better! Same link above. I also made an Anti-Alias sprite! I tried to make her have more detail and smaller pixels than Lace, because, true to her name, she is supposed to be at least a LITTLE Anti-Aliased. I WILL BUG YOU FOR EVER MORE!!!!!!!!!!!!!!!!! You guys will be missed. I am glad that the comic did go out on top, but its always hard to see something you enjoy end. How long will Merchandise be available? Totally thinking about picking stuff up now, even though im broke…. Goodbye, and thanks for all fish memories! Just finished listening to the show. Thanks for all the laughs, guys. You will be missed. Best of luck on all future endeavors. It’s a shame that something like this needed to come to an end, but that’s how things go, and I am sure you both are doing what’s best for you. Thanks for the weekly entertainment, and you’ll be missed. Yes, you are some fan. I mean only the most die hard fan would call them “stupid b****rds”, right? So this is the end of 2P Start!, huh? Well, I have a suggestion. Ray, if you ever have a kid,, Ray Jr. and Lily HAVE to make 3P Start! Okay, maybe not, but that would still be EPIC. In all seriousness though, best of luck in your lives, Tim, Ray. My only regret is not having a wild woody award ever…. I guess now is a good time to stop refreshing the site…..
It’s E3! Are you guys making another Podcast hmmmmmmmmmmm? Wow, I ended up reading some old comments on here and stuff…hard to believe it’s been 2 years. I can’t believe that was all I had to say 2 years ago too. I have some of the fondest memories of this site…you wouldn’t believe it. It’s crazy how much I loved coming back here week after week and coming back here will always induce a crazy amount of nostalgia. Thank you guys so much for this site. There are so many awesome memories attached here, and it’s a shame I don’t have you guys to talk about games with any more, my tastes have changed quite a bit since you guys called it quits. Looking back at some of my own comments, I think I may have said this before, but I ‘m really sorry for how critical I could be of you guys from time to time, but I’ve always been critical of things I love and see potential in and this was no different. This site was so awesome and I love that you guys still come back to it very regularly and that I can still come back to it and look back on some of the awesomeness. Again, thanks so much for all the effort you put into here. It was really, truly great. Appreciate your message, Roadjcat. Going back to this site is always a bizarre mixture of emotions, but we appreciated fans like you just as much as you did us. I’m glad things were able to end on such a memorable note, and I hope things are well for you. Every so often I notice the site sitting in my bookmarks (yes, I still keep it there) and I come back and read through some of the old stuff…now filled with Animal Crossing weeds, a humorous but kind of sad touch. haha. I can’t even believe it was more than a year ago since I wrote that last comment! I know I’m kind of just reiterating what I said a year ago, but I think it’s a good thing to remind you guys every so often that you guys really accomplished something fantastic here. And I am doing well, thank you (don’t know why I didn’t respond to that earlier), I hope the same holds true for you. Thanks roadjcat! I love that there’s a nostalgia factor to the site now for some of our readers as well as Ray and me. Never really thought that would happen, but there are some nuggets here that have aged very well and still bring me great joy!